homepage: A Trump-Tinged ‘Julius Caesar’: What Now? A Trump-Tinged ‘Julius Caesar’: What Now? 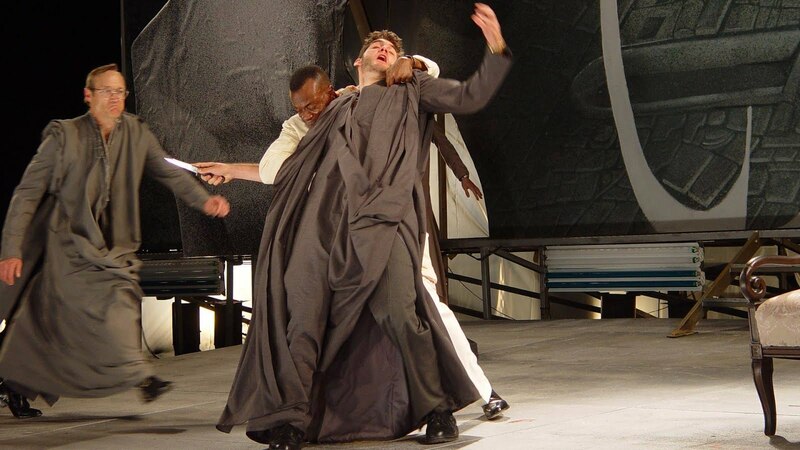 A 2003 production of 'Julius Caesar' at Cal Shakes, directed by Jonathan Moscone, featured L. Peter Callender as a Caesar that recalled the director's father, the late George Moscone. 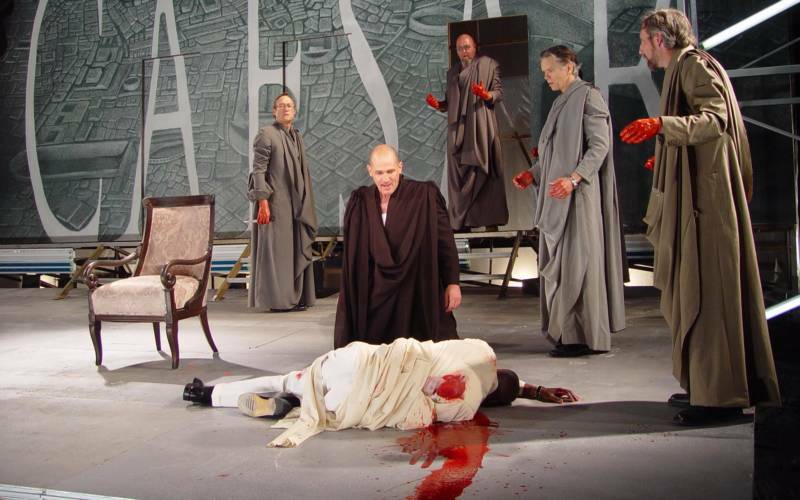 So it’s been no surprise over the past few days to witness the knee-jerk reactions from the Trump team, the right-wing media and two major corporations to the Public Theater’s latest production of Julius Caesar, which depicts the murder of a Trump-esque Caesar in gory fashion. Over the weekend, the president’s own son performed a wounded sparrow act on Twitter, Breitbart and Fox acted suitably scandalized and Delta Airlines and Bank of America withdrew financial support of the show. But there are several things art can do in the face of such an assault on the freedom of creative expression. The most important is to stick up for itself. Moscone has an interesting cautionary tale about the time he produced a production of Julius Caesar for the California Shakespeare Theater that speaks to this necessity. It was in 2003, when Moscone was near the start of his tenure as artistic director of the company. His take on Caesar -- like all productions of this play -- was politically charged, referencing the 1978 slaying of his father, San Francisco mayor George Moscone. But there’s a certain peril in staging productions that make obvious political parallels between Shakespeare’s world and our own. Should they end up failing in their mission to get the message across, they fail all the more spectacularly. Which brings me to the second important thing theater should do at this moment, which is to more carefully consider its tactics. When the Oregon Shakespeare Festival produced Julius Caesar in 2011 with a woman in the title role -- Vilma Silva -- you couldn’t help but have to balance Silva’s brilliant portrayal of a leader drunk on power with the murder of a female premier destroyed by the men around her. The production brought out all the complexities of Shakespeare’s play while making a strong feminist political statement without needing to resort to putting Silva in a Hillary Clinton pantsuit or Queen Victoria pearls. The reason we keep coming back to Shakespeare and other great dramatists like him is because their messages about power, leadership and its undoing transcend the moment. They endure. So whether a director puts Caesar in a toga or a red tie ultimately doesn’t matter. If it’s a strong production, its resonance to today’s world should be loud and clear. What’s a theater director to do? By presenting Shakespeare (or for that matter Bertolt Brecht, Suzan-Lori Parks or Caryl Churchill) in all its depth and subtlety, one risks reaching only fans of the performing arts, and the show tip-toeing quietly into oblivion. But when trying to grab the public’s attention with some kind of shock tactic that causes less than a moment of thought prior to eliciting a reaction, there’s every chance it will be misinterpreted. Which brings me to my third and final thing that theater can do: It should never give up. What the hoopla surrounding the Public’s Julius Caesar teaches us is that this art form can make a great noise and send the corporate overlords into a tailspin. As I write, I wouldn’t be surprised if others among the Public’s sponsors stepped up to redouble their support of the company in the wake of Delta Airlines’ and Bank of America’s withdrawal. And if the day should come when we end up in a nuclear wasteland, where all power is down and none of our electronic devices work, at least there’ll still be theater -- a few actors walking across a stage -- to bear witness, tell the important stories of our times, and spread hope.